We follow Surrey’s Agreed Syllabus for Religious Education which is non-denominational. Children are introduced to Christianity through stories, customs and celebrations, special places, people and artefacts. A carefully planned scheme of work includes teaching about aspects of two other religions, Judaism and Islam. 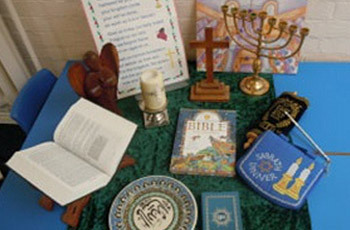 The experiences of our children are enhanced by religious artefacts, visitors and regular visits to our parish church. Spring What do Christians believe God is like? What are symbols and why do people use them? What do eggs have to do with Easter? Summer What is the Torah and why is it important to Jews Why do Jewish families celebrate Shabbat? Why should we look after our world? Autumn Why is Harvest a world-wide celebration? Why is the Bible an important book to Christians? What does the Christmas story tell Christians about Jesus? Spring Why is church important to Christians? Why do Christians call Jesus ‘Saviour’? Why is Easter important to Christians? Summer Who is Allah, and how do Muslims worship Him? What is important to Muslim families? Is prayer important to everyone?